Jamba Juice aspires to be more than a smoothie shop, apparently. 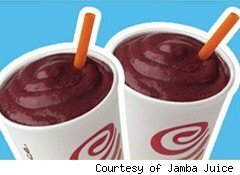 Get a 10% bonus in the form of a $10 Jamba Juice gift card when you place an order of $100 or more at the smoothie chain, which offers pick up or delivery service. Lunch for the office, perhaps? Jamba Juice's sandwiches, snacks, breads, smoothies and drinks have a healthy spin. They are not made with trans fats or high fructose corn syrup. A few days after you get your order Jamba Juice will email you asking where to mail the $10 gift card. You should receive the gift card in about two weeks. Caveats: you must order $100 of food to get the gift card.